Perfect for the deli, bakery, convenience store or anywhere you want to put your hot foods on display without them getting cold, a heated display case helps you create an eye-catching food display for more sales. Otherwise known as a commercial hot case or a heated display cabinet, these cases come in styles to suit every kind of food service business and menu. CKitchen is glad to offer the guaranteed low prices plus free shipping on heated cases by your favorite deli cases manufacturer, including Adcraft, Federal Industries, Hartco, Star and Piper Products. Not all commercial display cabinets are best for every application. In fact, we have many styles that are designed for specific foods. 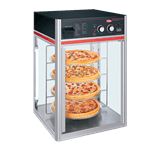 If you’re looking for something for your convenience store, gas station or cafeteria display, then you might want to consider a heated glass merchandiser made just for pizza, hot dogs or baked goods. We can also help you find hard-to-find displays, like a heated nut display or something for your house-made prepared foods. We also have several heated floor merchandisers that are versatile and large enough for many different kinds of hot items, from sandwiches to salads to scones. Choose a curved hot deli case if you love the traditional, bakery- or deli-style design, or opt for a countertop hot merchandiser with hinged front doors for easy access to food items inside. Many of these heated cases are equipped with built-in lights and glass de-foggers so that customers can always clearly see your offerings. Remember, CKitchen is always available to assist you with finding the right commercial display cases for your business.